Summer’s coming, which means we get to decorate our homes and gardens with beautiful summer flowers – like the aster! The aster is one of our favorite summer blossoms because it’s cheerful like we feel during summer and it looks like a shining sun. If you want to have color, gorgeous shapes, and summer-like energy in your home or garden this upcoming season, consider the aster for arrangements or flower beds. The aster is a splashy and showy perennial that ranges from small to tall. It’s a flower that makes a statement in an arrangement or garden – not a dramatic one, simply a “look at me, I’m here to enjoy life” kind of one. 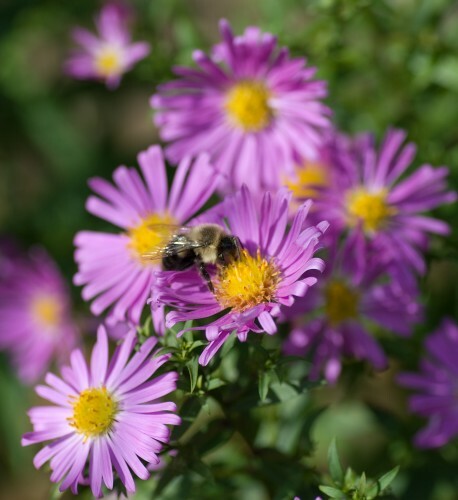 Asters offer vibrant shades and hues for a summer garden, such as pink, purple, white, and blue. They’re ideal flowers to keep outdoors if you want to attract butterflies and bees, and they also bring other wildlife to you. There are many types of asters, including New England, New York, calico, heath, smooth, aromatic, and wood. All of these asters are native to North American and the vary in terms of height, bloom time, and bloom color. The two primary varietals of asters are New England and New York asters. Some people have a hard time telling these flowers apart, but you can see the difference when you examine the tall stems of the New England asters (around three to four feet tall) and the shorter stems of the New York asters. New England asters are typically full and dense, and they bloom in late summer or early fall. New York asters have thinner stems and their leaves are smooth. Some of the asters you might be able to find near you include the Professor Anton Kippenberg New York aster and the Andenken an Alma Potschke New England aster. If you can’t find asters near you, consider looking online. You’re sure to find someone that will ship asters to you or ship their seeds.